Try the liberty of a better vision without glasses or contact lenses. A revolutionary program that uses special gas permeable contact lenses is offered by our Center since 1993 to improve myopic sight without surgery, already since the first day of application. miopy and astigmatism are reduced, and your sight sharpness without lenses ( visus ) is improved REMARKABLY. The Orthos Program avails itself of a series of special contact lenses that can be carried during sleep and removed when waking up in the morning, consenting a good sight sharpness along the whole day. The result is improved vision without lenses. Ythe contact lenses for Orthocheratology have a peculiar design, named ” inverted geometry ” which allows the eye front curve (cornea) to change gradually and slowly its profile, thus improving sight sharpness. The high permeability to oxygen and the exclusive ” tear reservoir ” are associated to reshape comfortably and progressively the cornea. This procedure is safe, effective, and has satisfied hundreds of people in our Center and worldwide. Myiopia is the most common visual defect, it afflicts 40% of the population of the USA, among them 2/3 of College Students. The myopia condition tends to worsen in adolescents and young adults even when they use appropriate glasses. The images that enter into a sound but myope eye are focalised before thye retina, instead, as they should, on the retina. The myope eye is too long, cornea is curved too sharply, this causes a confused vision of far objects. Astigmatism is a common visual defect that causes difficulty to read, headaches, confused vision. The curve of cornea not being uniform, focalisation takes place in different points on the surface of retina. 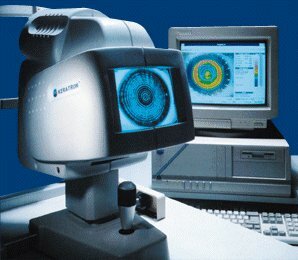 In our Center, the use of COMPUTERISED TOPOGRAPHY OF CORNEA and of nanotechnology allows to apply the Orthos lenses prepared with the method of “ELECTRONIC PANTOGHRAPHY” of cornea. The result of this system is a remarkable reduction of trials, of adaptation time, hence un unparalleled comfort. In this program, a practical trial of lenses is made already in the first visit, followed by an examination of sight sharpness without correction. This will consent the patients to appreciate the improvement of sight sharpness when they remove the lenses. Many improvements of sight occur quickly during the first days of treatment, therefore frequent controls an progressive change of lenses are necessary. The Program lasts between 3 and 6 months, depending on the seriousness of the visual defect. Once the best possible result is obtained, The patient is given lenses suitable to stabilize the results. After about six months of use of these lenses it is possible, by means of proper maintenance lenses, to reduce gradually the number of hours during which lenses must be worn, although preserving a good vision of far objects. The contra-indications are the same for those who wish to wear contact lenses of any type for the first time: therefore hyper sensitivity of the eyes, active eye pathologies, appearance of allergic reactions and all medical contra-indications to the use of contact lenses. A slight and moderate miopy with visual sharpness without lenses of at least 2/10, can be improved to obtain from 7/10 to 10/10 of natural visual sharpness. Higher degrees of miopy are now suitable to obtain excellent improvements and less dependance from glasses, which before was impossible to obtain. RESEARCH Four different studies from American Universities research have shown that Orthokeratology is as safe as wearing a pair of traditional contact lenses. Short term visual improvements have been prooved successfully on hundreds of subjects, since 1962, by the world’s most qualified experts of contact lenses. It is now generally acknowledged that the contact lenses are a most effective method to stop or slow down the growth of miopy, and it is interesting to know the study conducted by Herman Kemmet Muller. In this study, published by the Contact Lens Journal in1987, the author reports on 46.312 myopic subjects surveyed in periods of up to 35 years: of 25.630 subjects who have been wearing spectacles, 71,73% continues to undergo growth of miopy; instead, among the other 20.682 subjects who have been wearing semi-rigid, traditional contact lenses, 72,5% have stabilised the degree of miopy. This implies that , if a young myope chooses the spectacles as habitual method of sight correction, he has 3 chances to 4 to undergo worsening, whereas he has 3 chances out of 4 to stabilise miopy by using contact lenses. Improvement of sight without recourse to surgery. After usiing the lenses you will simply see better, even without glasses or lenses. Your sight improves quickly, since the first days. All Orthos lenses are studied and prepared specifically for each subject ! In sport and amusement, vision free from glasses and contact lenses. Pilots, Fire Brigade and Police Officers , are now enabled to reach the required standards without recourse to lenses or to chirurgy. Prevents the progression of functional miopy growth in the younger subjects. The Orthos lenses are more comfortable in comparison to the traditional gas permeable lenses. Are available both for traditional daytime use, and for night time use ( during sleep ).